Igor Vasilyevich Kurchatov (Russian: Игорь Васильевич Курчатов; 12 January 1903 – 7 February 1960), was a Soviet nuclear physicist who is widely known as the director of the Soviet atomic bomb project. Along with Georgy Flyorov and Andrei Sakharov, Kurchatov is known as the "father of the Soviet atomic bomb" and, later, "the father of the Soviet Nuclear Missile" for his directorial role in a clandestine Soviet nuclear program formed during World War II in the wake of the USSR's discovery of the Western Allied efforts to develop nuclear weapons. After nine years of covert development, as well as Soviet spies successfully infiltrating the Manhattan Project, the Soviet Union successfully tested its first nuclear weapon, codenamed First Lightning at the Semipalatinsk Test Range in 1949. In 1954 he was awarded the USSR State Prize in physics. From 1940 onward, Kurchatov worked on and contributed to the advancement of the nuclear weapons program, and later advocated for the peaceful development of nuclear technology. In 1950, Kurchatov contributed in the development of the Hydrogen bomb with Andrei Sakharov who originated this development as Sakharov's Third Idea. Other projects completed under Kurchatov included the installation and development of Soviet Union's first particle accelerator, the Cyclotron, inauguration and establishment of the Obninsk Nuclear Power Plant, the world's first nuclear power plant in Obninsk, and the completion and launching of the Lenin, the first nuclear-powered surface vessel, under his leadership, in 1959. Kurchatov was born in Simsky Zavod, Ufa Governorate (now the town of Sim, Chelyabinsk Oblast) in the family of a chartered surveyor. He was of Russian ethnicity. After completing Simferopol gymnasium №1, he enrolled at the Physics department of the Crimea State University, earning his doctorate degree in Physics there, under the supervision of Abram Ioffe. Kurchatov also studied at the Polytechnical Institute in Petrograd where he earned his degrees in naval engineering. After studying Physics and Naval engineering, Kurchatov was a research assistant at the faculty of Physics of the Ioffe Physico-Technical Institute in Baku. Later he researched under Ioffe at the Physico-Technical Institute on various problems connected with radioactivity. After working in a variety of research laboratories and the Azerbaijan Polytechnic Institute in Baku for a year, he came to the Leningrad Institute for Physics and Technology (the Russian abbreviation of this famous institution is LFTI) in 1925. Kurchatov's talent for experimenting and organization was recognized there. His early work was consumed with physics of crystals like dielectric and ferroelectric materials. Kurchatov felt at home with these studies. One of his important results was the discovery of ferroeletric properties of Seignette salt. This discovery earned a degree of doctor of physics and mathematics for him. He was awarded this degree without a dissertation in 1934. In 1932, he received funding for his own nuclear science research team, which built the Soviet Union's first cyclotron particle accelerator in 1939. Between 1931 and 1934 he worked in the Physical department of the Radium Institute (Leningrad) which was headed by Vitaly Khlopin [ru] where Kurchatov was researching as a senior scientist and took part in the creation of Europe's first cyclotron (work was started in 1932, the cyclotron was completed in 1937). Then to 1943 he worked at the Ioffe Institute with Anatoly Petrovich Alexandrov. In that period (by November 1941) they devised a method of demagnetizing ships to protect them from German mines, which was in active use through the end of World War II and thereafter. Kurchatov's laboratory separated from the Ioffe Institute and moved to Moscow in 1943 for the work on the Soviet atomic bomb project. In 1932, George Gamow and Lev Mysovskii submitted a draft for consideration by the Academic Council of Radium Institute, which was approved by the Soviet government. Khlopin, under the guidance and direct participation of Igor Kurchatov, Lev Mysovskii and George Gamow, installed the Europe's first cyclotron particle accelerator. Installation was finished in 1937, and the research began to take place on 21 September 1939. Kurchatov and his apprentice Georgy Flyorov discovered the basic ideas of the uranium chain reaction and the nuclear reactor concept in 1939. In 1942 Kurchatov declared: "At breaking up of kernels in a kilogram of uranium, the energy released must be equal to the explosion of 20,000 tons of trotyl." This announcement was practically verified during the atomic bombing of Hiroshima. Kurchatov as employee of the Radium Institute in 1939. I. V. Kurchatov took part in many scientific experiments through 1933–1940. Together with K.D. Sinel'nikov he started working on the first proton accelerator at the Kharkov Institute for Physics and Technology in 1933. Also that year he headed organizing the committee of the First All- Union Conference on the Atomic Nucleus. Kurchatov studied neutron absorption by the nuclei and discovered nuclear isomerism two years later in 1935. Later in 1935 he held a seminar on neutron physics, while also working with L.V. Mysovskii at the State Radium Institute. In 1937 he investigated resonance neutron absorption by nuclei. Kurchatov started to take part in cyclotron and the development in 1941 jointly with A.I. Alikhanov of the LFTI cyclotron and completed it after World War II. Finally he helped with the discovery of the fission process with O.Hahn and F. Strassman and then they started an in depth investigation of uranium. This investigation brought about determining the number of secondary fission neutrons; isolating uranium-235 as a fissile isotope; and, finally discovering the spontaneous fission of uranium-238 with G.N. Flerov and K.A. Pertzhak. In 1941, the Kurchatov group had joined the ranks of the leading laboratories in Europe and the United States. Then this group started working on chain reactions. Kurchatov was aware of the unique prospects of this new research area and became a member of the Uranium Committee at the Academy of Sciences. V.G. Khlopin headed the Uranium Committee at the Academy of Sciences in 1940 and 1941. This committee wrote to the government arguing that they needed to boost uranium research. The Soviet's nuclear project under Kurchatov happened in three broad periods. The first phase is from 1935 to 1945, which was the research stage. Then the building of the atomic industry and atomic weapons phase was from 1946 to August 1949. The third stage was the progress of the atomic industry, the creation of hydrogen weapons and the birth of the atomic power generation and the atomic fleet in the Soviet Union from 1950 to 1957. In the research stage Kurchatov assembled the Ioffe School's physicists. He assembled his own people to enlist the support of the many familiar schools like of the RIAN and the Institute of Chemical Physics, and the Institute of Physics of the Academy of Sciences (known in the Soviet Union as FIAN) to work out physical problems. The physical problems occurring were not being able to obtain nuclear data needed for the startup of a physical reactor; not being able to find a model of nuclear-blast physics; not being able to obtain plutonium in "impulse" microgram quantities; and lastly, not being able to develop a process for obtaining ultrapure graphite and metallic uranium. The engineering and industrial phase began in early 1945. This phase can be considered phase of the project. It is said that Kurchatov was caught nodding when a new political situation arose after the atomic bombing of Hiroshima and Nagasaki in August 1945. The second phase began on 20 August 1945 when the State Defense Committee made the decision to set up a Special Committee, a Technical Board, and the First Main Administration to be put in charge of the implementation of the atomic project. Kurchatov and his team were in charge finding out new problems, at the time, unknown to scientists. This team acted as research supervisors of major engineering projects, which include: the startup of the first physical reactor, Ph (1946); the design, construction, and startup of plants for plutonium production, radiochemical extraction, and metallurgy (Kurchatov, plants A, B, V, Chelyabinsk-40, in 1948 and 1949); the development of a physical reactor and an industrial heavy-water one (Alikhanov, Laboratory no. 3, 1949; OK-180, Chelyabinsk-40, 1951); the development of a manufacturing technology of diffusion separation of uranium-235 and uranium-238 (I.K. Kikoin, plant D-1, Sverdlovsk-65, 1949–1951); the development of industrial mass separators for the electromagnetic separation of isotopes of uranium (L.A. Artsimovich, SU-20, Sverdlovsk- 45, 1950); and, finally, the design calculation, modeling, construction, and production of the first atomic bomb (Khariton, Arzamas-16, 1946–1949). During this industrial phase, Kurchatov's team of engineers, those on construction sites, plant floors, and research laboratories completed these missions within three years in 1942 to 1945 (Gaponov). The results of these missions were the solution to the Soviet's nuclear safety. Decree no. 5070- PHYSICS OF ATOMIC NUCLEI Vol. 66 No. 1 2003 1944ss/op, signed by Stalin (29 October 1949), concerning the award of atomic project participants , in which Kurchatov's name tops the list: "In view of his exceptional service to the Soviet Fatherland in the matter of solving the problem of utilization of atomic energy and pursuant to the Council of Ministers Decree no. 626-258, of March 21, 1946, the Council of Ministers of the Union of Soviet Socialist Republics hereby DECREES: I. 1. KURCHATOV, Igor' Vasil'evich, academician, scientific leader of the atomic reactor and atomic bomb project: to be nom-inated for the title of Hero of Socialist Labor; to be awarded a bonus of 500 000 rubles . . . "to bestow upon Academician I.V. Kurchatov the title of Laureate of the Stalin Prize First Class; to build . . . and transfer to Academician I.V. Kurchatov a town house and a dacha . . ..". The third stage of Kurchatov's work began at the end of 1949. Kurchatov was handling with being a scientific leader of the project to perfect nuclear weapons and create hydrogen weapons and also being a scientist with a vision to build the foundation for the future advance of nuclear science and engineering. The first group of researchers that helped solve the problem to find a unique design of a nuclear-thermonuclear weapon was led by Sakharov Puff in 1953 known as RDS-6 these group members were I.E. Tamm, Z.S. Belenky, V.L. Ginzburg, A.D. Sakharov, Yu.A. Romanov, and I.Ya. Pomeranchuk, V.N. Klimov, N.N. Bogolyubov, and D.V. Shirkov. Later, a joint team headed by Khariton discovered the basic physical principle of modern thermonuclear weapons, radiation implosion, and carried out a successful test in 1955 the team included: Ya.B. Zel'dovich, Yu.A. Trut- nev, and Sakharov. Achieving these scientific discoveries effectively solved the strategic task of securing the Soviet Union's nuclear similarity with the United States. It created a basis to stop the atomic race, both sides started to lean towards political solutions that could lead to the discontinuance of the nuclear race and cessation of nuclear tests, and Kurchatov was also a necessity to that step. In 1941, Germany commenced a large-scale military offensive against the Soviet Union under codename Operation Barbarossa. During this time, Kurchatov was leading the research in nuclear physics and was widely known in the Soviet Academy of Sciences for his wide research. Because of the war with Germany and her allies, the Soviet Union did not undertake any serious initiative to start scientific research into nuclear weapons until 1942. In April 1942, Georgii Flerov, who would later become a key figure in the nuclear program, addressed a secret letter to Joseph Stalin pointing out that nothing was being published in the physics journals by Americans, British, or even Germans, on nuclear fission since the year of its discovery in 1939, and that indeed many of the most prominent physicists in Allied countries seemed not to be publishing at all. This academic silence was highly suspicious and Flerov urged Stalin to launch the program with immediate effect as he believed that other nations were already secretly advancing their programmes. In 1943, the NKVD obtained a copy of a secret British report by the MAUD Committee concerning the feasibility of atomic weapons, which led Joseph Stalin to order the commencement of a Soviet nuclear programme (albeit with very limited resources). Stalin turned to the Soviet Academy of Sciences to find the best administrator to lead the program, and as a result, the Soviet Academy of Sciences chose Kurchatov for his wide experience in nuclear physics. Ioffe recommended Kurchatov to Vyacheslav Molotov who advised Stalin to appoint Kurchatov as the formal director of the nascent Soviet nuclear programme and the development of Soviet nuclear weapons began in the 1940s. Kurchatov switched his research first to protecting shipping from magnetic mines, and later to tank armour, and finally to nuclear physics. During its formative years, the atomic bomb project remained a relatively low priority until information from spy Klaus Fuchs and later the destruction of Hiroshima and Nagasaki goaded Stalin into action. Stalin ordered Kurchatov to produce a bomb by 1948, and put the ruthless Lavrenty Beria in direct command of the project. The project took over the town of Sarov in the Gorki Oblast (now Nizhny Novgorod Oblast) on the Volga, and renamed it Arzamas-16. The team (which included other prominent Soviet nuclear scientists such as Julii Borisovich Khariton and Yakov Borisovich Zel'dovich) was assisted both by public disclosures made by the United States government and by further information supplied by Fuchs, but Kurchatov and Beria (fearing the intelligence was misinformation) insisted his scientists retest everything themselves. Beria in particular would use the intelligence as a third-party check on the conclusions of the teams of scientists. On 29 August 1949, Kurchatov's team successfully detonated its initial test device First Lightning (a plutonium implosion bomb) at the Semipalatinsk Test Site; Kurchatov later remarked that his main feeling at the time was one of relief. In the wake of the successful detonation of the U.S's first fusion device, codenamed Ivy Mike in 1952, Stalin ordered Soviet scientists to build a comparable device, a program that was launched in 1953. The directors of this project were Vitaly Ginzburg and Andrei Sakharov who originated this project as Sakharov's Third Idea. Kurchatov contributed some of the calculations necessary for the Soviet Union's first hydrogen bomb. Unlike Ginzburg, Sakharov, and Yakov Zel'dovich, Kurchatov was only involved in small scale calculations, applying the basic nuclear weapons principles used in the smaller nuclear weapons that were developed under his directorship. In 1953, the Soviet Union detonated its first thermonuclear device, codename Joe 4. While other scientists, such as Ginzburg, Zel'dovich and Sakharov earned renown, Kurchatov's contribution was diminished. In the late 1950s, Kurchatov advocated against nuclear weapons tests. Among the projects completed under Kurchatov's leadership was the first cyclotron in Moscow (1949), the first atomic reactor in Europe (1946), the first nuclear power plant in the world (1954), the icebreaker Lenin, the world's first nuclear-powered surface ship, and the first nuclear-powered civilian vessel (1959). In January 1949 Kurchatov had been involved in a serious accident which became a catastrophe at Chelyabinsk-40 in which it is possible that even more people died than at Chernobyl[dubious – discuss]. In an effort to save the uranium load and reduce losses in the production of plutonium, Kurchatov was the first to step into the central hall of the damaged reactor full of radioactive gases. Kurchatov's health sharply declined in his last years. He suffered a stroke in 1954 and died in Moscow of a cardiac embolism on 7 February 1960 aged 57. He was cremated and his ashes were buried in the Kremlin Wall Necropolis on Red Square. 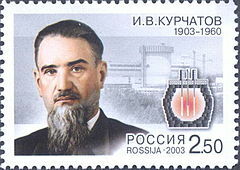 Kurchatov on a 2003 stamp of Russia. Monument to Kurchatov at the Semipalatinsk nuclear test site's Central Staff office. During the A-bomb programme, Kurchatov swore he would not cut his beard until the program succeeded, and he continued to wear a large beard (often cut into eccentric styles) for the remainder of his life, earning him the nickname "The Beard". Two towns bear his name: Kurchatov Township, the headquarters of the STS, and Kurchatov near Kursk (the site of a nuclear power station), the Kurchatov Institute is named in his honour, and bears a large monument dedicated to him at the entrance. The crater Kurchatov on the Moon and the asteroid 2352 Kurchatov are also named after him. Many of his students also enjoyed distinguished careers, among them Andrei Sakharov, Victor Adamski, Yuri Babaev, Yuri Trutnev and Yuri Smirnov. Awarded the following medals: "For Victory over Germany", "For the defense of Sevastopol"
Recipient of the Lenin Prize (1957). Kurchatov was buried in the Kremlin Wall in Moscow, a burial place reserved for top Soviet officials. In 1960 his institute was renamed to the I.V. Kurchatov Institute of Atomic Energy, and in 1991 to the Russian Research Centre Kurchatov Institute. The Kurchatov Medal was established by the Academy of Sciences for outstanding work in nuclear physics. In the Transfermium Wars element naming controversy, the USSR's proposed name for element 104 was "kurchatovium", Ku, in honor of Kurchatov. Element 104 is now known as rutherfordium. ^ a b c d e f g h i j k l m n o p q r s t u v w x y z aa ab ac ad ae af ag ah ai aj Gaponov, Yu. V. (2003). "Igor' Vasil'Evich Kurchatov: The Scientist And Doer (January 12, 1903 – February 7, 1960)" (PDF). Physics Of Atomic Nuclei. 66 (1): 3–7. doi:10.1134/1.1540651. ^ Aleksandrov, A. P. (1983). "Годы с Курчатовым". Nauka i Zhizn. 2. ^ Regel, V. R. (1975). "Размагничивание кораблей в годы Великой Отечественной войны". Priroda. 4. ^ Medvedev, Zhores A.; Medvedev, Roy Aleksandrovich (2003). The Unknown Stalin. I.B.Tauris. pp. 163, 165. ISBN 978-1-86064-768-0. Wikimedia Commons has media related to Igor Kurchatov. DeGroot, Gerard (2004). The Bomb: A History of Hell on Earth. Pimlico. ISBN 0-7126-7748-8.